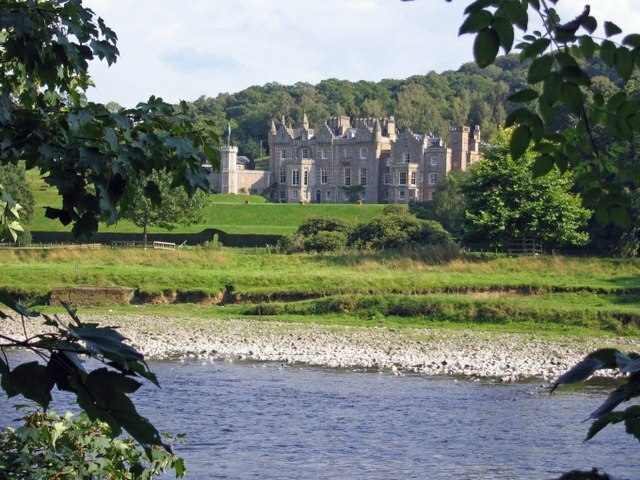 Sir Walter Scott lived here. I'm still mad at myself. One of the bloggers I've been reading for a while recommended a webinar by someone he's been following for a while. Since the webinar was about increasing your blog's readership, I thought, what the hey-ho, I'll give it a try. Now the business success gurus like Mr. Dale Carnegie came up with this idea that you've got to give something to get something. In retail, this is known as the loss-leader theory of success and it is straightforward. You offer some product free, or at a huge discount, to get people in the door of your shop--or shoppe, if you're sophisticated. Getting them in the door once, even if it means you don't earn top dollar off that customer the first time, builds loyalty, etc, etc, and makes it more likely they'll come back to your business next time they need something you sell, and they'll pay full price for it. In other types of business this give-to-get theory works more abstractly. Maybe you offer a free class, or take up a philanthropic cause and spend time you could be raking in the dough working on that cause, with a little advertising of your business on the side. Plus you're there, a representative of your business, doing this philanthropic work, and therefore your business becomes linked with charity, honor, and integrity, which might lure more people there. Give-to-get. The abundance success gurus like Deepak Chopra also subscribe to this give-to-get theory. Waters are murkier here, but the idea is that once you start "giving" then you start "receiving." All of which is explained in metaphysical terms both flowing and vague, so that trying to understand them is like trying to get a clear picture of yourself reflected in the water. What I mean by that analogy is that getting a clear picture of yourself reflected in water is nearly impossible. Even this stillest ponds have their water striders creating ripples. The image is always a little distorted. Distortion is good business for the mystical-spiritual-abundance theorists (Deepak Chopra, for example), because then things are open for interpretation. Like what exactly they mean by "abundance." Or "giving," or "receiving." Most of us choose to comprehend abundance as quantities of lucre. I'm just being honest. But the abundance gurus squirm out of that definition by saying it's much more--or less--or different--than material gain. It's an internal sense of abundance. I have no problem with either actual, material abundance, or an internal sense of it. Don't get me wrong here--which I doubt you are, if you know me, or read me regularly. What I do have a problem with is people who try to shimmy their way around the give-to-get thing by pretending they're actually giving something, when what they're actually doing is getting, getting, getting. There are a lot of people out there trying to succeed in a material way who've absorbed this gotta give to get thing. And they're all on the internet. Many of them have blogs. Lots of these blogs are about how to write, or how to write good blogs, or how to blog, and therefore how to write good blogs. Their blogs start out seeming interesting, but turn into repacking the same old stuff, and then turn into sales pitches for their ebooks, which turn into sales pitches for their talks. Because, let's be honest here, they all want to be rich and ingenious enough to give a TED talk, but have to settle for JrTEDxx. So they decide that they can follow the give-to-get rule of success by GIVING a webinar, and hopefully starting on the road to GETTING a TED talk. Mostly, I avoid these people. However, readers, I got sucked into one last week. It was about how to develop your blog's readership, and I read about it on a blog by someone who blogs and writes ebooks about how to write. I'm still mad at myself, because I wasted sixty whole minutes of my afternoon on this webinar. This webinar promised to teach me 7 Foolproof ways to increase my blog's readership. Forty-five minutes into this webinar, created by someone who looks like he could be my son and talks like every salesman you've ever avoided most assiduously, I had one (1) foolproof way to increase my blog's readership. Then I learned what I'd been realizing for the last 30 minutes, that for a certain (undisclosed until the last minute of the webinar) sum, I could sign up for a series of these webinars to learn the other 6 methods. Now, I'm not saying that one tip was stupid. It was actually kind of interesting. It was an instruction to only present one idea per blog post, along with a graphic illustration of a way to format the blog post. However, it took all of (I'm being generous here) 5 minutes to present both the idea and the format. Meanwhile, it wasn't until that 46th moment that the creator of the webinar mentioned that this webinar and all his information was directed towards businesses and bloggers who want to sell something, and not to writers. And then--and I have only myself to blame for this--I listened to the last fourteen minutes of this webinar. Now, I justify this additional waste of fourteen of my life's precious minutes as research. Research into the sheer audacity of this webpreneur in diapers; research into the way many of these self-help success books are applied by up-and-coming would-be successes; research into the expanded sales pitch. Mostly, however, I wanted to know how much this brazen young man planned to charge for the other 6 Foolproof methods. Perhaps I ought to hold off on revealing his price until my next blog post. After all, I've already given you a couple of tidbits of information. However, since I've already failed to apply the 1 Foolproof method of attracting readers that I learned at this webinar, I might as well give it up right here. He was selling his other 6 points for $500. That's right. Another six hours of filler with a couple of pointers thrown in for $500. Which just goes to show, there's no such thing as Foolproof. I am here to tell you that. *"Oh, what a tangled web we weave...., etc" by Sir Walter Scott. Thanks for the tip, Jody. I've got Wayne Dyer on my to read list.